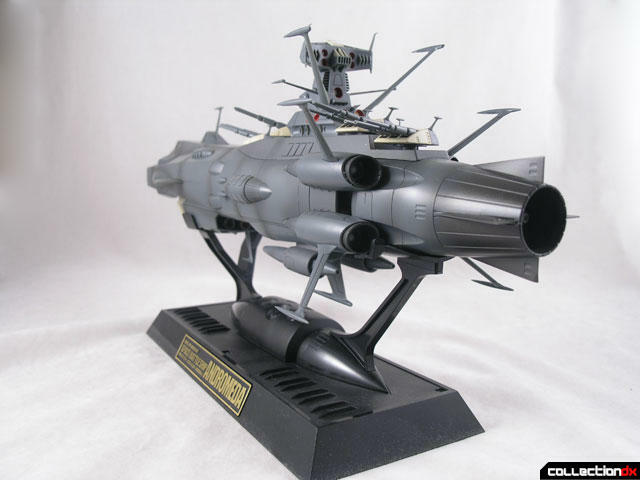 The Space Battleship Andromeda comes from the animated television series Space Battleship Yamato, which aired in the US as Starblazers. 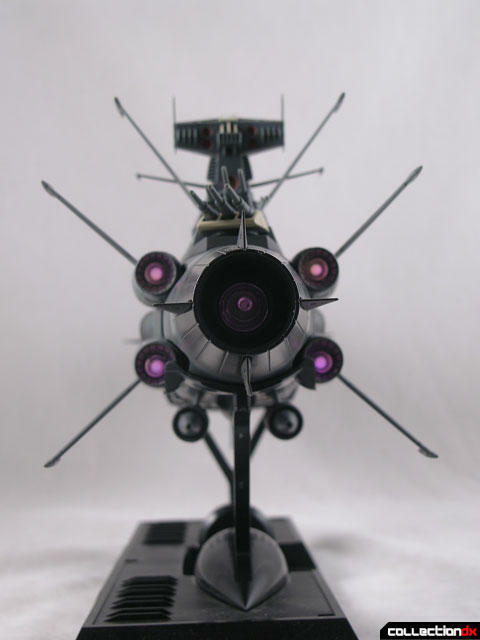 The Andromeda makes it’s first appearance in Yamato 2 – or the Comet Empire series. In the first series, the planet earth is under attack from the planet Gamilus, driving all life underground. Across the galaxy a message comes from the planet Iscandar. The message contains information about a machine located outside of the solar system that can save the earth. In this message are also plans for a new type of engine called the Wave Motion engine, which not only gives humans the ability to travel great distances across space, but also provides them with a powerful new weapon – the Wave Motion Gun. Throughout the first series of Yamato, we follow the crew on their voyage to Iscandar and back as they fight and defeat the Gamilon Empire. The earth is saved. 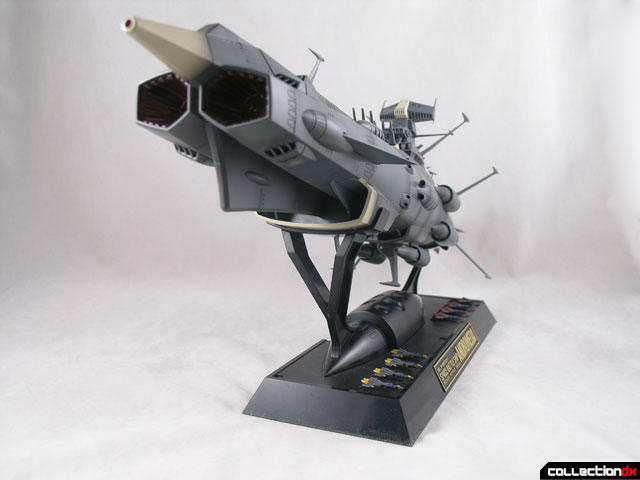 Series two opens and the Yamato has been demoted to patrol duty on the outer rim of our solar system. 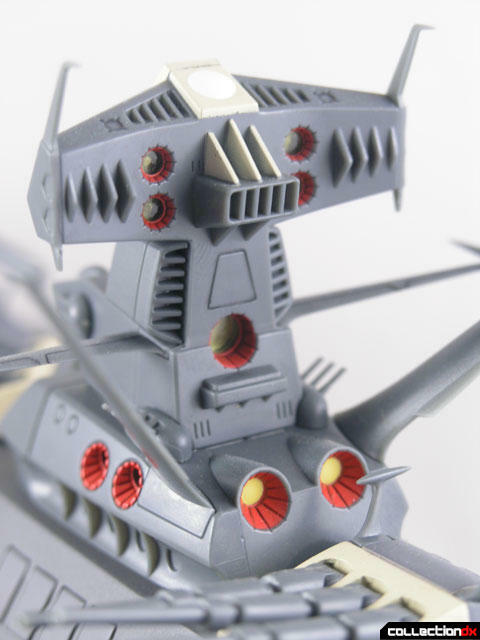 The Earth’s military powers have analyzed the new Wave Motion technology, and have begun to manufacture new and more powerful space battleships. 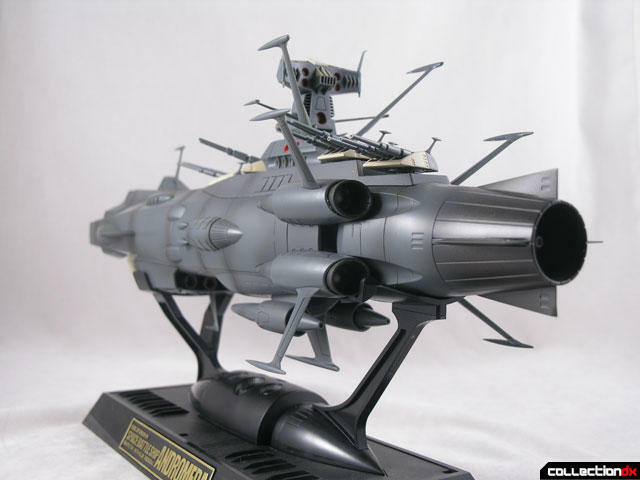 The flagship of this new fleet of ships is the Space Battleship Andromeda. The Yamato is engaged in an attack with an unknown enemy and races back to earth to inform others. 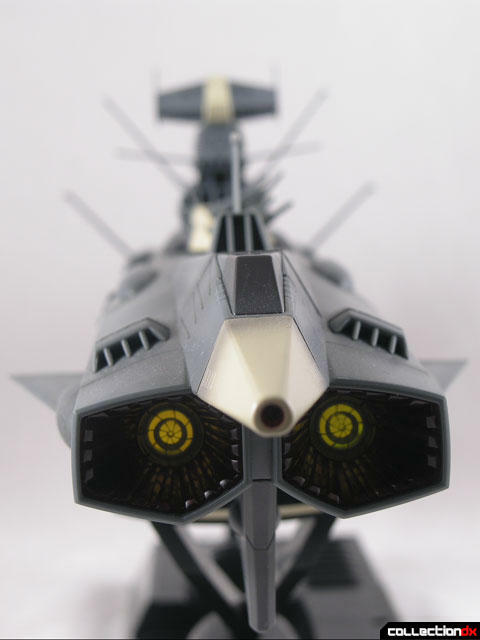 As the Yamato approaches earth, it finds that its approach path is blocked by another vehicle – the Andromeda. 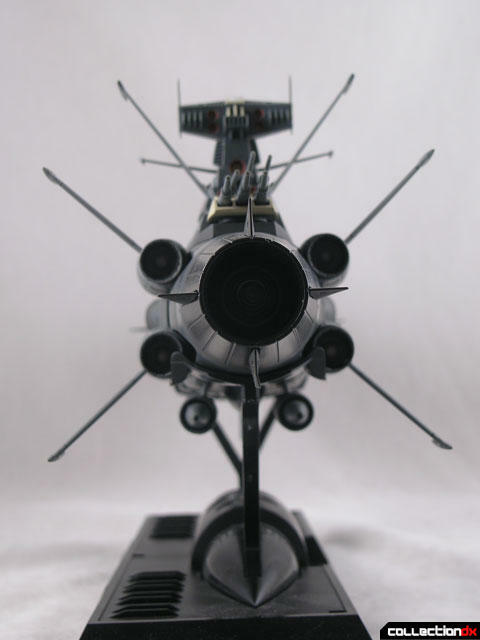 The acting captain Susumu Kodai will not alter the Yamato’s path, claiming it has right of way. 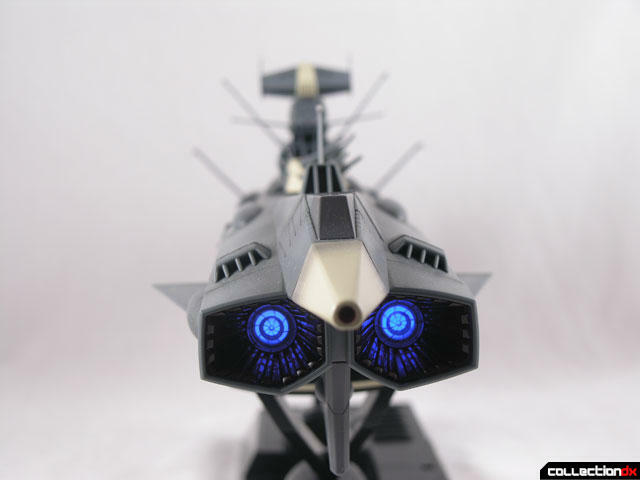 The captain of the Andromeda, Ryu Hijikata will not alter his, claiming that it is recording flight data which will be corrupted if they alter course. The two ships literally scrape alongside one another in their first meeting. Back on earth, the captain of the Andromeda invites Kodai to inspect his ship. The Andromeda is almost completely automated, with automated gunning stations, automated navigation and automated engine rooms. The Andromeda has two wave motion guns, and a more efficient engine. It is then that Kodai learns that the aging Yamato is due to be retrofitted with the very same technology. 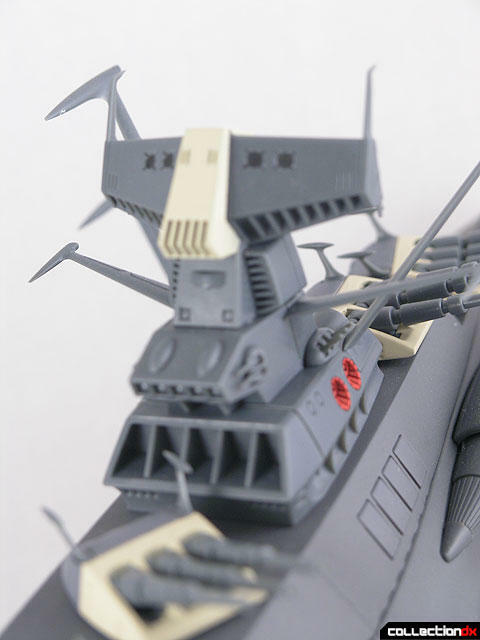 Kodai protests the upgrade, saying that the crew of the Yamato is its soul, but his cries go unheard. 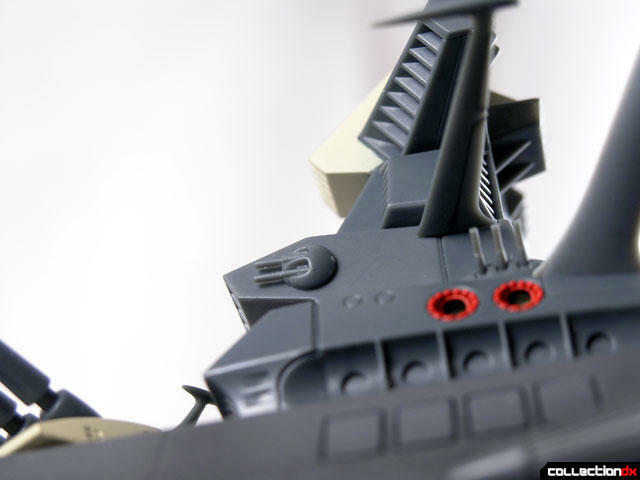 The Yamato is put into dry dock and the upgrades begin. 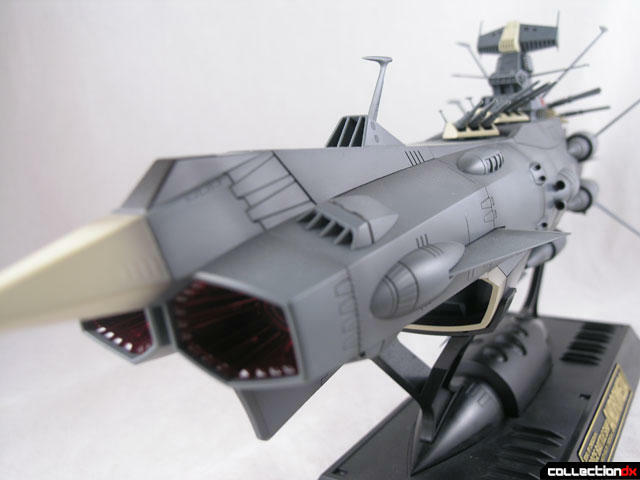 He then begins to amass the former Yamato crew and launches the partially-upgraded Yamato against orders. 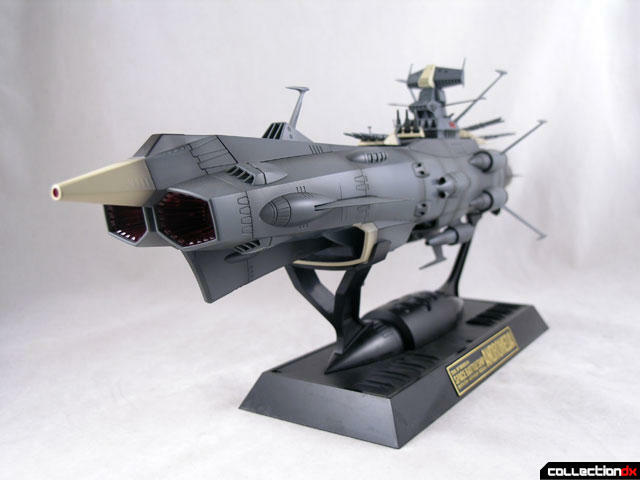 Once in space, the Yamato again encounters the Andromeda. And that is our long-winded introduction to the Andromeda. I felt it was important to give you some background about what this ship is and why it’s important. You do see the Andromeda again, but you’ll have to watch the series to see how and when. The Soul of Chogokin GX-58 Andromeda is beautiful. 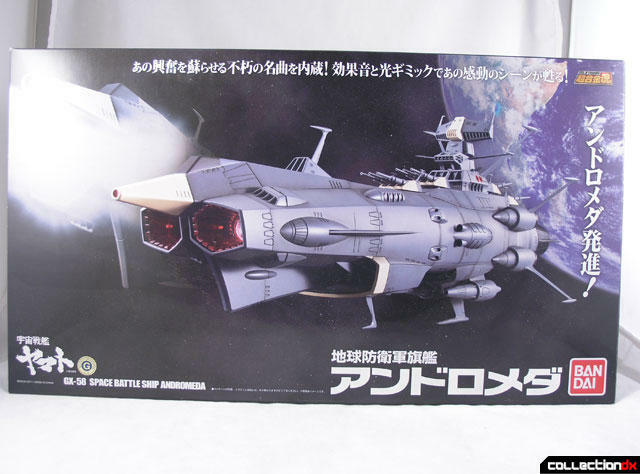 It’s the second time the ship has been represented in large-scale toy form; the first being the Marmit Daigoikn Andromeda, which is obscenely expensive. 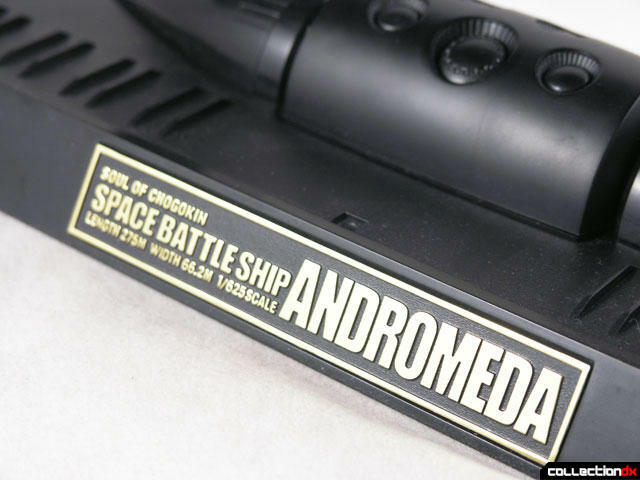 At about half the price, the Bandai Andromeda is a bit more accessible. Still it is a luxury item, and priced accordingly. The box is huge but unremarkable. Inside is a cardboard tray, with a styro tray for the ship, and two plastic trays for accessories. 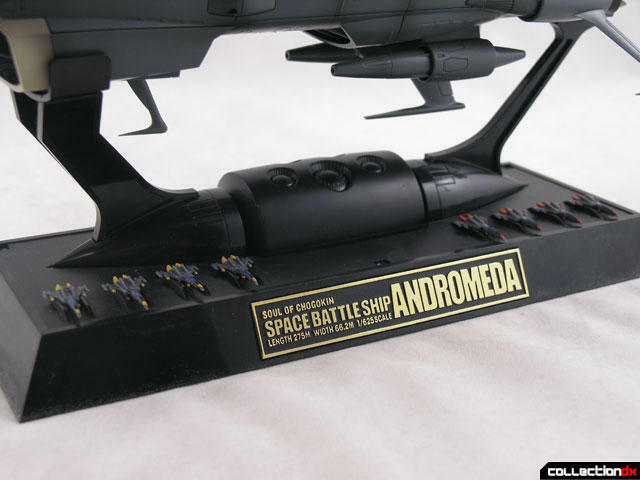 The Andromeda is 1/625 scale, the same scale as the SOC (and SOP) Yamato. 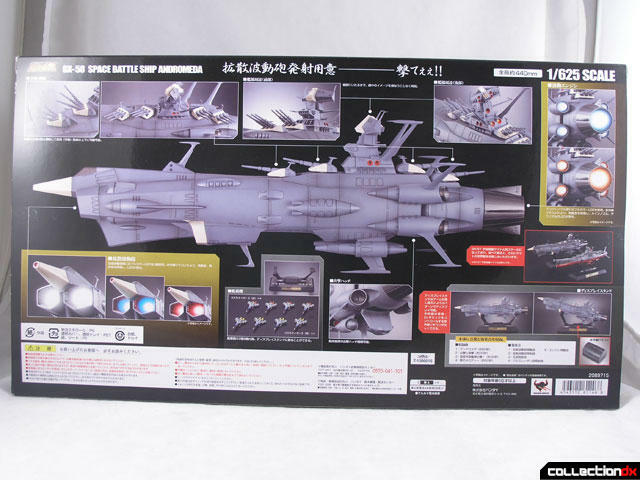 This toy is noticeably bulkier and beefier than the Yamato. From nose to tail it comes in at 44cm long. This is a delicate machine. 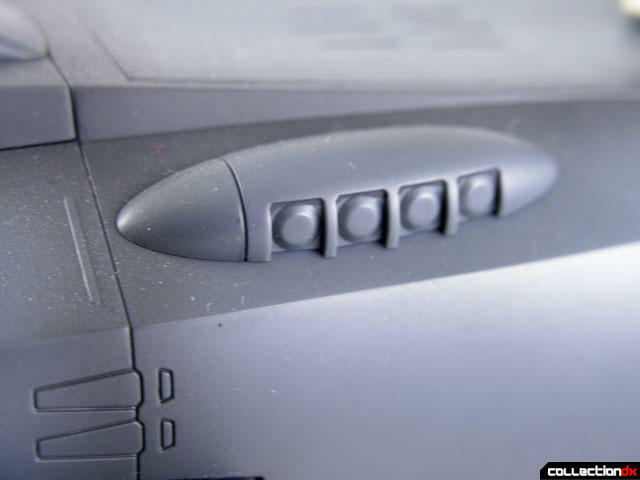 There are all kinds of antenna and fins that stick out all over the place. While they are firm, there is a risk of breakage. Don’t expect this to survive a shelf dive. Physical gimmicks are limited. 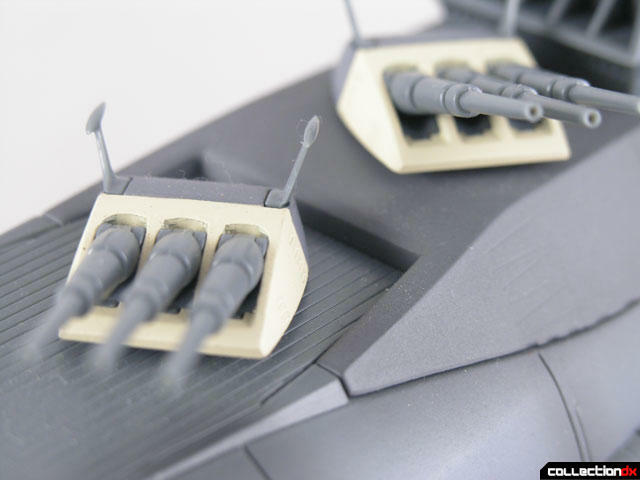 Aside from the light and sound there are four main gun turrets that rotate in sync. 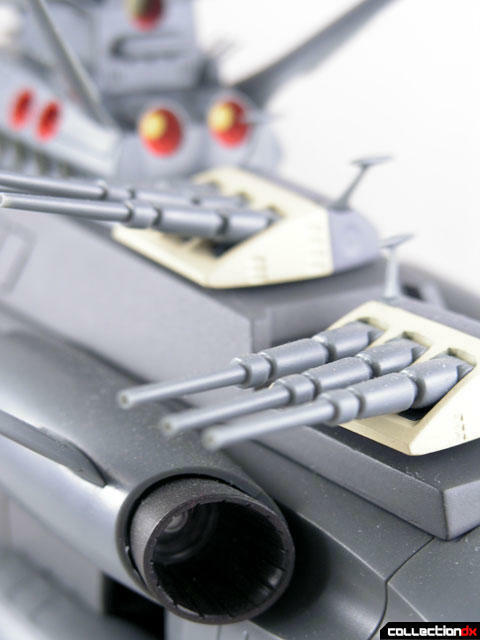 The barrels of each cannon can be moved independently. Use caution when rotating the cannons – make sure the barrels are elevated so not to catch on the cannon in front of it. There’s a door under the rear that acts as s landing bay for the included fleet of fighters. Four Red and four Yellow Cosmo Tigers are included. The light and sound effects are what really make this toy fun. 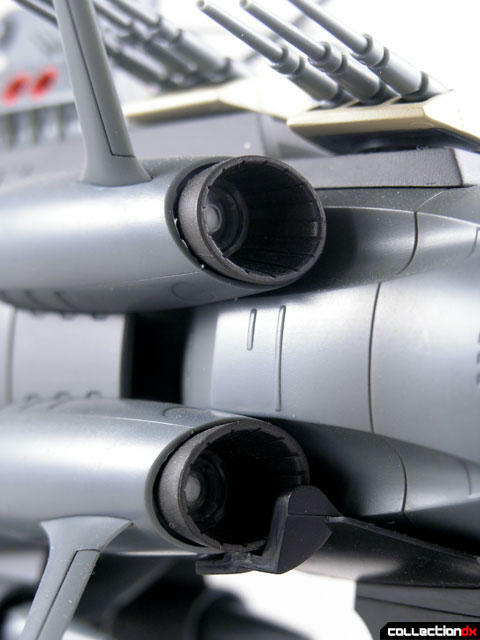 The features are activated by a remote control that clips into part of the base. You must also turn on the switch underneath the Andromeda as well as on the remote. The range and angle of reception of the remote is very limited so be sure to point the remote at the squares on the side of the ship as indicated in the instructions. The controller has a large button in the center with smaller buttons around it. The large button powers up the Wave Motion Gun The lights pulse as the sound ramps up, and even begin to change color. Press the middle button again to actually launch the gun. 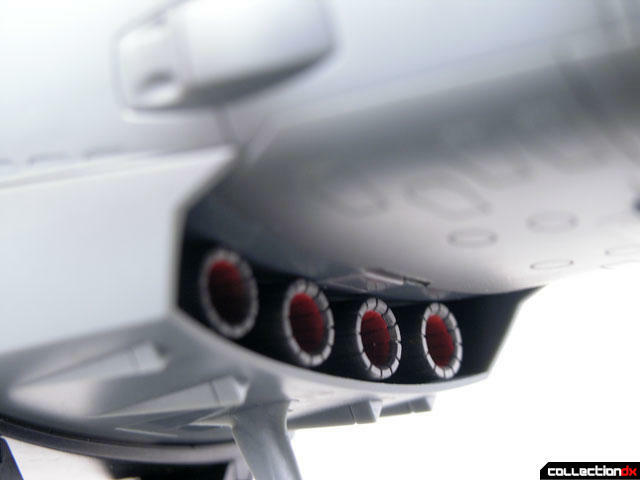 The smaller buttons provide various weapon sounds as well as rear engine lights and sounds. The engines also pulse and change color. Press a combination of the large button and any small button and you can hear a series of music tracks associated with the ship, including its theme song. What’s great about this is after the music is playing you can continue to layer on sound effects like the cannons firing and the engine igniting. It’s great! 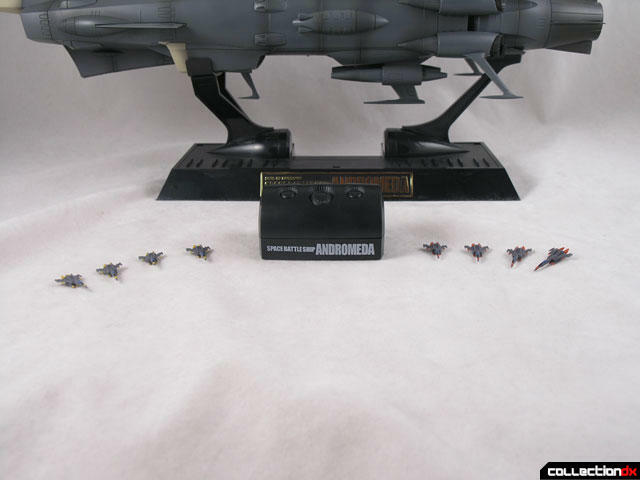 Also included is a two position display stand, with spaces for all eight Cosmo Tigers. The fighters just rest on the stand though, if you bump it they come off. To change the Andromeda’s position on the stand you have to swap out stand parts. Some complain that this does not belong in the SOC line as it is a vehicle, and I agree. However it is here and there is not much we can do about that. There is significant heft due to the metal content, but I would have liked more. 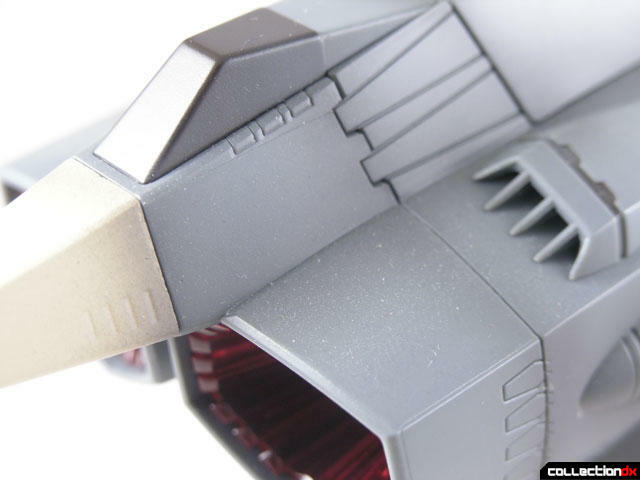 The underside front, lower brige area, lower mid section and tail engine section are metal. 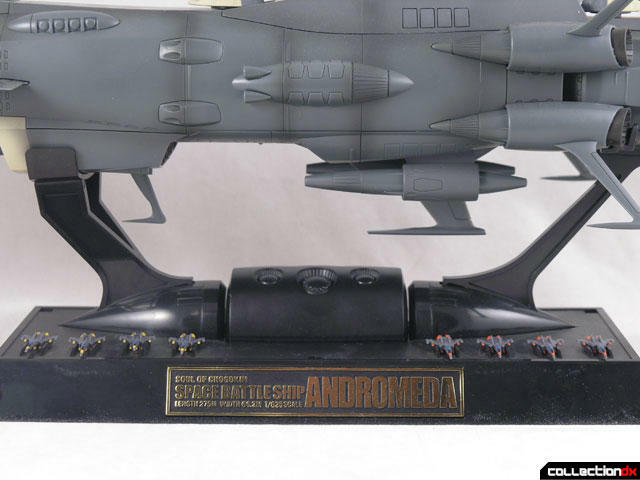 While this is more of a cool desk model than a toy, I love that it exists and that I finally own a nice Andromeda. It’s too bad they didn’t make one of these in the 70s with missile firing wave motion guns and friction wheels! The SOC Yamato has all 5 buttons = a light or sound effect...the SOC Andromeda only has 4, so nothing is broken...when I got mine, i thought that the fourth button on the outside did not work, until I noticed music played from button with center button for music and told you in confusing icons/reviews on pamplet. And as always Josh's reviews are great! Hi Josh, good review as always. I think it would be also interesting to have your opinion on a comparison between GX-58 and Daigokin Andromedas (sculpt, metal content, gimmicks, etc). I've always wanted a large Andromeda. 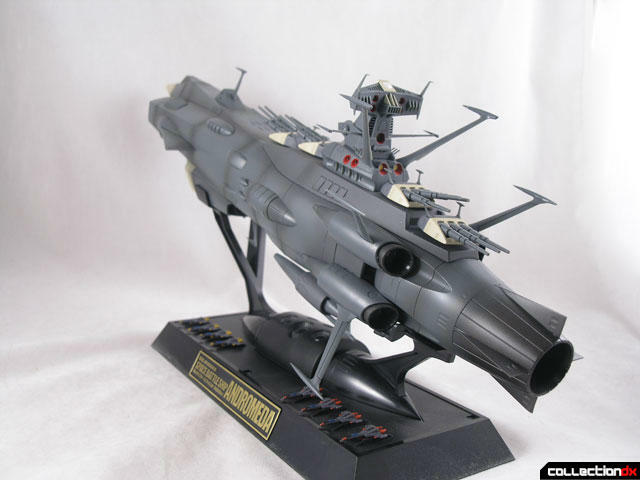 To know this one is in scale with the SOC Yamato is key. Can't wait to get one of these. Why do people even care whether or not that this is a SOC? That makes no sense to me. I don't get it. I am still undecided whether to buy this or not! But after reading Josh's review and yesterday was payday, well... .